"What I'm hoping that the March Against Monsanto will accomplish is..."
Roger: "What I'm hoping that the March Against Monsanto will accomplish is an awakening of the people of what they, their children and pets are eating." Kim: "show people that The People are tired of corporations buying politicians, Supreme Court Justices, government entities. We're AWAKE, AWARE and not going to stand for it any more." Bennette: "to bring awareness to the destructiveness of Monsanto's bedlam of so called safe Scientific Technology, their monopolization of our Governmental entities and seed supplies worldwide." Diana: "raise public awareness, about the health risk with the GMO foods being grown and sold to consumers." Bonnie: "at LEAST labeling healthy food for my family." Louise: "To STOP the big corporations from taking away our basic rights - to fresh food - NO ONE or Corp has the right to brand a seed as their own and limit us to what we can eat and what we can't eat... they want full control.. I SAY NO !!!" Kansas Conni: Increased awareness that includes the revolving door between big companies like Monsanto and congressional representatives and why regulation is not a bad word. Dylan: "for people to realize that it is critical for us to begin to sustain and liberate each other." Marcy: "to bring awareness to the food crisis, so that we may band together to defeat Monsanto. My own reasons mirror all of the above. I also demand that Monsanto executives and stockholders be barred from holding decision making positions within the USDA, FDA, EPA, or any government agency that regulates the products that this company manufactures. Also, I'd like strict labeling laws. 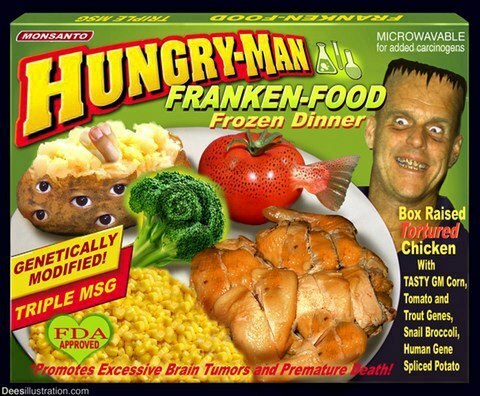 No Frankenfood for me. Thanks LeighAnn... Can't wait to see what tomorrow brings...Thanks for the post!